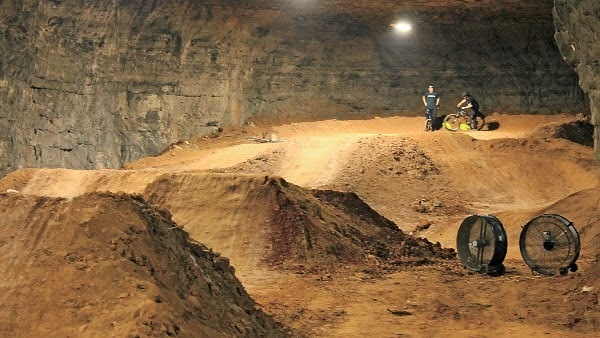 [Photo: "Mega Bike" at the Louisville Mega Cavern; photo courtesy Louisville Mega Cavern]. At 320,000-square feet, the facility is massive. Outside Magazine explains, "the park will have more than five miles of interconnected trails that range from flowing singletrack to dirt jumps to technical lines with three-foot drops. And that’s just the first of three phases to roll out this winter." That's from an interview that Outside just posted with the park's designer, Joe Prisel, discussing things like the challenges of the dirt they've had to use during the construction process and the machines they used to sculpt it. It's not the most architecturally-relevant interview, if I'm being honest, so there's not much to quote here from it, but the very idea of a BMX super-track 10 stories underground in a limestone mine sounds like a project straight out of an architecture student's summer sketchbook, and it's cool to see something like this become real. You take a wide view of architecture. But is architecture PLANNED modifications? Can effects of human activity be defined as architecture, things like sink holes, caused by ground water depletion or tailing dam failures, architecture? All of these spatial effects could easily be discussed using architectural or structural metaphors, but my overall approach on this site is also to look at landscape and cities—not just architecture proper—which also lend themselves to a general discussion of all things spatial, whether they're accidental or designed. That's why comets, geology, meteorology, and more show up so often. My kids went zip lining there a couple of years ago.. They loved it. interesting facility, they also have a big Christmas lights thing they do in the mine.